The Coues White-tailed deer is distinctly smaller than most of its whitetail cousins, and resides in only a small percentage of North America. The range of the Coues whitetail is limited to regions of Arizona and New Mexico; and a few states in northern Mexico. Across their range, the Coues whitetail thrives in a wide variety of habitats from the desert floor to mixed-conifer forests. The majority, however, are found at elevations ranging from 3,000 to 7,000 feet on what biologist describe as “desert islands.” “Desert islands” are mountain ranges that rise up from the desert floor, isolating the deer and its habitat by a desert sea. Recognized as a separate trophy category by record-keeping organizations such as Boone and Crockett, Pope and Young, and Safari Club International, the Coues whitetail is a highly sought after trophy by many deer hunters each year. In October, Coues whitetail are easily patterned by observing feeding habits. During this time of the year, bucks travel in bachelor groups and can be more visible. If you find a good buck or group of bucks, it is likely that you will see the same buck(s) again. October also brings warmer weather and creepy-crawlies, such as rattlesnakes and scorpions; keep that in mind. In November, bucks still maintain normal feeding patterns, but some rut activity will occur. Some bachelor groups may still be running together, but more often than not, large bachelor bands have dis-banded and some bucks will now travel alone. A bucks range may expand as the month reaches the latter days. Temperatures in November are still warm, on average. However, prepare for all conditions—wind, rain, and even snow—you never know. The peak of the Coues occurs in early- to mid-January. However, rut activity begins in December. During the rut, bucks are much more likely to move around in search of doe groups, and may be spotted in locations they have not been in the previous two months. If you see a shooter buck, make a good, but quick shot. Odds are high of spotting good bucks, but you may not see the same buck twice. Weather can be a factor on the later hunts; much colder temperatures are the normal, and wind, rain, and even snow are possible. Be prepared! The Coues whitetail resides in steep, rugged, and mountainous terrain across their range. Just getting to a vantage point to glass for deer may require a one-mile trek with an elevation gain of 1,500 feet or more. Being in top physical shape is essential to turn the odds in your favor. The best workout is one that focuses on cardio, while involving the whole body. Any of the P90X-like programs that are out there will work sufficiently. Alternatively, make it realistic; try wearing a weighted backpack while climbing up and down a flight of stairs. Over time, add more weight to the backpack and more stairs to the climb. Not only will this build stamina, it will also help condition your legs. Eventually, work up to three workouts per week with 20-30 pounds over 20-30 minutes, without stopping. Of course, if possible, the real thing is always the best preparation. Walking over rocky, uneven terrain is the best method to prepare, and time spent in Coues country or at least outdoors is time well spent! Need help, check out Be the Predator. Having a rifle capable of shooting accurately at long distances, and a shooter capable of doing so is a paramount requirement for Coues hunting. An average shot at a Coues buck is approximately 300 yards. Several calibers will do the job, such as traditional calibers like the .270, 30-06, and .300 Winchester Magnum; newer short magnums such as the .270 WSM, 300 WSM, and a host of others will also suffice. Most importantly, choose a rifle that you feel comfortable with and can shoot accurately on a regular basis. Practice real-world shots. In addition to shots that are longer than average, shots are oftentimes uphill or downhill. A solid rest is crucial to make your shot count. There are several products available to aid in the process including shooting sticks, bipods, and tripod adapters. Sometimes the best rest is the prone position over your backpack. Keep in mind that both uphill and downhill shots in essence, make the shot closer. A laser rangefinder is a great tool, especially those that compensate for elevation changes. One of the hardest aspects of shooting Coues deer in the field is setting up for the shot. In many cases, the hunter is out of place for a good shot because of many factors: steep slopes, vegetation, poor natural rests. Additionally, Coues deer reside in steep country and many shots are either uphill or downhill, making it hard to use shooting aids like bipods and shooting sticks. When possible, the best shooting aid(s) that I have found is the combination of a front and back rest, a bipod or shooting stick as the front rest and a backpack or other firm object used as a rear rest—its rock solid. A successful deer hunt starts with early season scouting. Scouting provides invaluable information about Coues deer behavior, habitat, and specific deer movement patterns in a given area. Begin your search with some investigative research. To start, review topographic maps and satellite images of your hunting area. Locate likely deer resources, such as feeding areas, bedding areas, and water sources; next, go check them out on foot. At the minimum, scouting should provide the following: 1) a general knowledge of the hunt area(s), 2) access and entry points into hunt area(s), 3) possible vantage points to glass from, and, of course, 4) sightings of Coues deer, hopefully bucks. The goal is to compile a plan of action for the fast-approaching hunt. 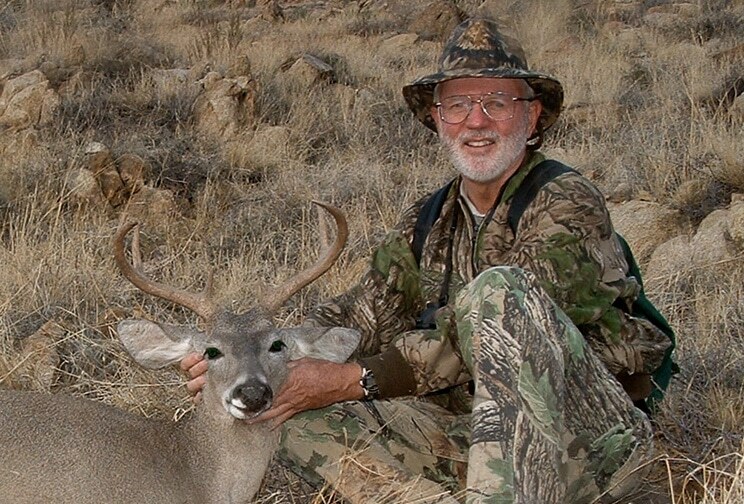 The most prevalent method of Coues whitetail hunting is spot-and-stalk. Successful spotting of a small target in its comfortable habitat requires the quality optics use. Throw away your $50 binoculars, and get a top of the line pair of binoculars, capable of mounting on a tripod. Swarovski, Leica, and Leupold make binoculars for the ultimate Coues hunter. Glassing for hours on end requires the use of a tripod. The best tripods are sturdy, lightweight models with telescopic, maneuverable legs, and a good panning head. Additionally, to field judge Coues bucks accurately, a good spotting scope is necessary. Get the best scope you can afford. If it is out of the question completely, several binocular companies offer a product known as a “doubler,” which doubles the magnification of one tube of a binocular, which can be used as a spotting scope. Hunting Coues deer in rough country usually means getting into some steep and rugged areas. Each day should begin with a trek in the dark to a vantage point to glass for deer. Coues deer, especially mature bucks thrive in mountainous terrain; be prepared to tackle some steep slopes and hikes over a mile for best results. Get there early by beginning your hike in the darkness, and finishing in low light, prior to sunrise. Better yet, pack in for the duration of the hunt and avoid several ascents and descents. If you choose to pack in water will be your limiting factor; plan accordingly. In either case, be prepared to stay all day. Pack a lunch and hunt hard all day long. The harder you hunt, the greater your chance of success. In my estimation, patience is a Coues deer hunter’s best friend. Sitting behind a pair of binoculars for several hours and several days takes extreme patience. Furthermore, a patient hunter knows when to be passive and when to be aggressive. Although Coues bucks are good at giving hunters the slip, you never know when they may just hide right in front of your nose. Don’t make a mad scramble at a buck you saw 500 yards away on a distant ridge. Plan a methodical attack, even if it means coming back the next day. Prior to the hunt, set a goal for yourself. If any legal buck will suffice, just state it as such. If you are more of a wildlife manager, set your sights on a mature buck with three points (plus eye guards) per side. If you are a true trophy hunter, make it 100-inches or bust. The most important thing is to set your goal, and stick with it. Having a specific goal in mind during your pursuit adds to the hunt, and is a great reward when it comes to fruition. Remember, any day hunting is better than a day spent at work. No matter the details of the hunt, don’t get down; be persistent and positive, and above all else, have fun!